They’ve got it wrong again. But now and again the tendency to think eludes their PR branch. Australia’s western shore, Leeuwin Current, unlike most western shore continental currents, flows toward the pole (away from the equator), carrying warm tropical water into a cold ocean. 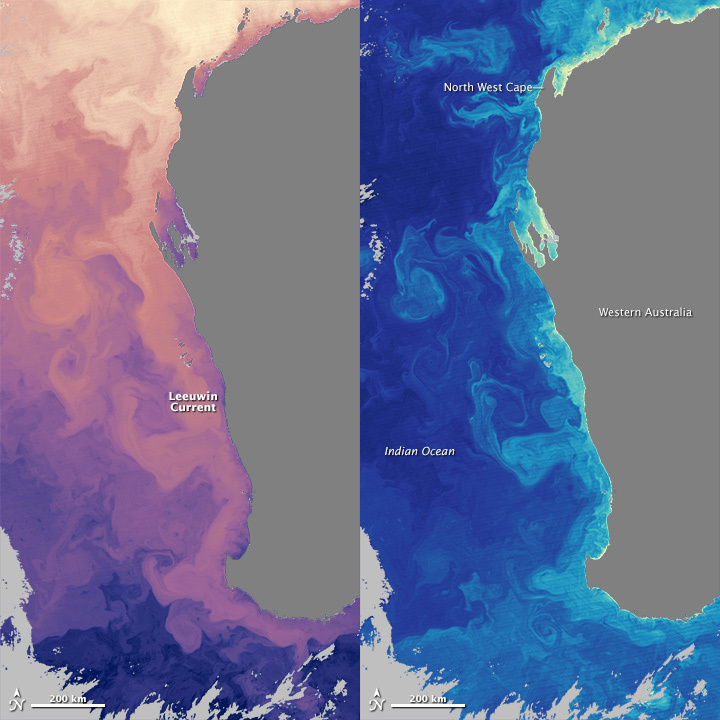 In the MODIS image from NASA’s Aqua satellite taken on 6 June 2014, warmer water is orange and pink, while cooler water is purple. It is the world’s longest coastal current, extending 3,400 miles from the North West Cape to the west coast of Tasmania and moderates the climate, making it hospitable to marine species normally found much closer to the equator. Its warmth also encourages rain to fall on western Australia, saving it from the extreme dryness found on the south-western shores of the other southern continents. Without the current, western Australia might resemble South America’s Atacama desert or southern Africa’s Namib desert. The current normally contains limited nutrients, the ocean is a desert of repressed upwelling, surface waters seldom get recharged with nutrients from the ocean floor. There has obviously been an abundance of upwelling “with nutriments from the ocean floor”. I dare say something similar -or its polar opposite, is occurring along South American and African coastlines.